Sylhet is a fantastic place for tourists to visit. It is a gift from Bangladesh to all the nature and adventure lovers. Sylhet is considered as the Queen of natural beauty. Sylhet stands on the banks of the Surma River surrounded by the Khasia and the Jainta Hills on the north and Tripura Hills on the South. bus services from Uttara Fakirapul, Saydabad , Kalampur, Panthopath etc. Time: 6 - 7 Hours (Bus), 7-8 hours (Train),45 minutes (Air). Explore: Jaflong, Lawachawra Forest, Goyain etc Bangladesh. Accommodation: Hotels, Cottages ,Motel etc available. Terraced tea garden, mountains and big waterfall showers, beautiful rivers, thick tropical forests and countryside extending to many tribal communities, the horizon being filled with natural beauty and greenery is an amazing experience. Sylhet holds many species of wildlife and a variety of greenery can be witnessed by the tourists who intend to visit Sylhet. A fascinating feature of Sylhet is the tribal people who live there. They respect nature much more than urban people do, they live in total harmony with the beautiful trees and rivers which surrounds them. The main tribal people of Sylhet are Monipurs, Garos, Khaisas, and Tippeares. They live in the hills with a lifestyle that might seem exotic for tourists visiting from the urban areas, but their lifestyles are healthy and in harmony with nature. Tourists can visit Sylhet during February where they will be able to see the festival of the tribal people, the Rash Leela. There the young tribal girls wear beautiful dresses and dances with their beloved partner. Also, there is a place named Dolijatra which is another ritual witnessed by the tourists. The famous ancient mythic dance based on the theme of love known as the Monipur Dance can also be witnessed by the tourists I the Dolijatra. Sylhet is a very well maintained place, the security and police force are aware to avoid any unwanted situation. There are various ways of going to Sylhet, by bus train or plane. Jaflong is situated right on the border between Bangladesh and the Indian Meghalaya States. A river by the name of Mari, which directly comes from the Himalayas, flows beside Jaflong. Jalong is arguably one of the most renowned tourist spots in Bangladesh. In Jaflong, a tribe name Kashai has been living for many generations, and tourist can have an up close and personal experience with the Kashai people visiting Jaflong. Every year hundreds of tourists, from Bangladesh as well as from all over the world, visit Jaflong. Jaflong is a place of mesmerizing beauty. Tourists can see the process of collecting stunning stones by the stone carrying boats standing by the side of the Jaflong River, or even can swim and relax in the river and observe the various beautiful stones of Jaflong. The river Goyain of Jaflong is stunning in appearance as the water of the river is fully transparent, and tourists can see the wonderful variety of stones in Jaflong and fishes and other animals swimming underneath. Jaflong is very famous, since the British era, for its stones. Also tourist can rent a boat and travel and see the spectacular river Mari whose origin point is in the ancient Himalayas. Furthermore, nearby tourists spots from Jaflong are Lawachawra Forest, one of the national sanctuaries of Bangladesh, the Majar of Shah Jalal and Shah Poran. Another place which is just five kilometer from Jafllang is Tamabil where exist an immigration point between Bangladeshi and Indian citizens through which, with a valid passport, tourists can cross the border. Moreover, for those people who are travel hungry and always remain in a constant lookout for a right destination, Jaflong is highly recommended. Jaflong is a place which can provide the tourists an experience of immense refreshment. 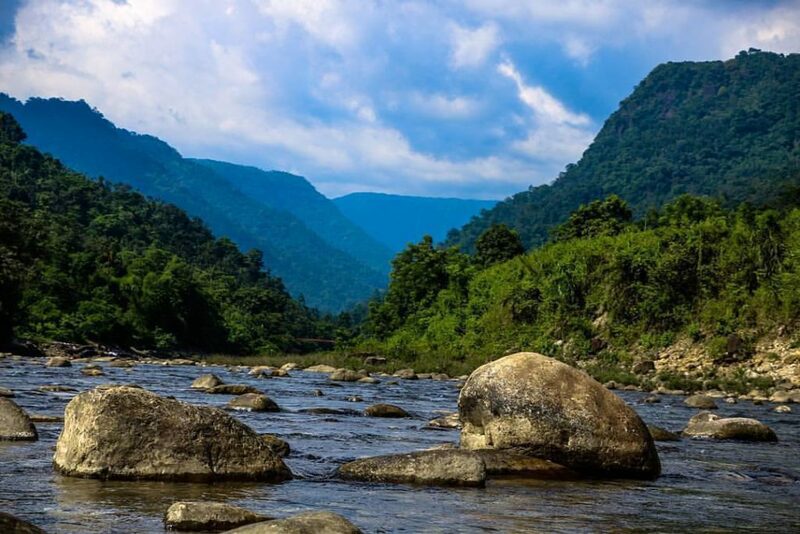 The beauty of nature available in Jaflong can be found in the tranquility and harmony persisting in the stones, water, distant trees and the sky. The experience of this tranquility can make tourists and travelers refreshed and rejuvenated from the tiring and repetitive urban life. 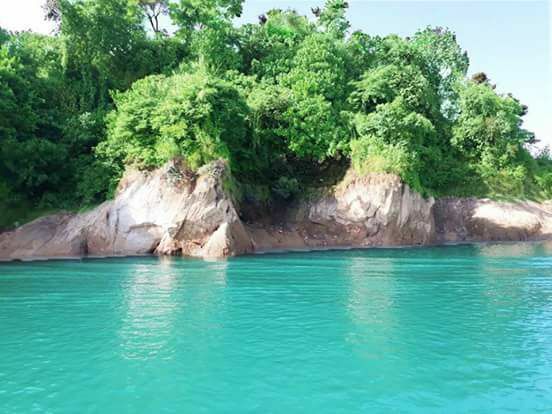 Tourists can feel and experience the real beauty of Jaflong if they visit the place in rainy season, particularly starting from the mid or end of April until the End of August. The rain revives and creates magic in the place called Jaflong. 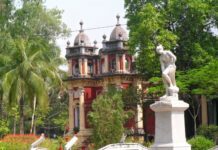 How to travel from Dhaka to Jaflong? The distance of Sylhet from Dhaka is approximately 310 kilometer, and the distance of Jaflong from the central town of Sylhet is 60 kilometers. 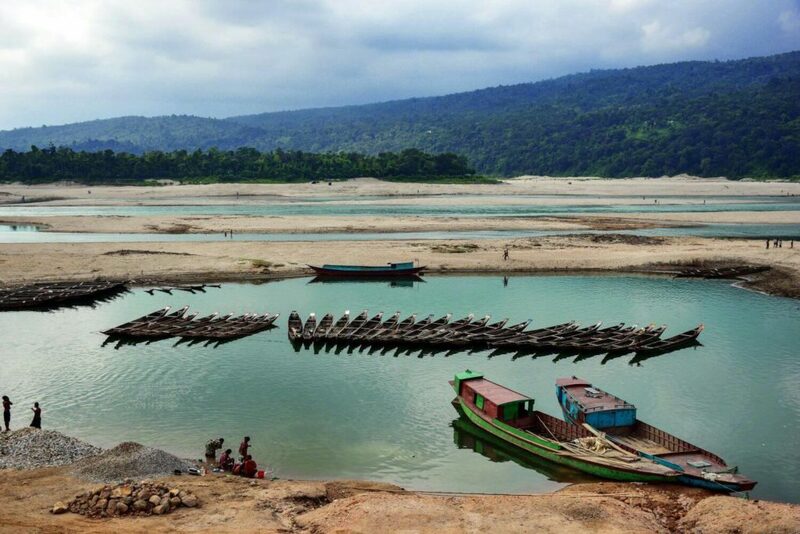 Through car, it usually takes 6 hours to reach Jaflong through the Dhaka-Sylhet Highway. There are numerous bus services available at various points in Dhaka such as Shamoly, Rajarbag, Saidabad, etc. which can take people to Jaflong. Apart from bus, there is train service available through which tourists can travel to Sylhet from Dhaka, and if the tourists are to avail themselves of the train service, they will simply need to go to the Komolapur Railway Station and get on the trains that go to Sylhet. There are services such as Joyantika Express and Kalani express. By train it usually takes 7 hours to reach Sylhet. There is yet another medium through which tourists can visit Jaflong, and that is by air. Tourists going through the air will have to land in Sylhet Osmani International Airport and then take car or jeep to travel to Jaflong. Lalakhal is one of the most visited places in Sylhet. It is a fact that tourists and travelers adore Lalakhal as each year, so many tourists visit Lalakhal. A land covered with hills of various size and shapes which is an absolute treat for the eyes, the rivers under the Jainta Hill which flows from India and enters into Bangladesh travels along the way as it take turn, the breeze of the riverside wind as it touches one’s face are things which will surely touch a tourist’s heart and will leave an impact at the core of his/her travelling experience. Lalakhal also has natural forest, and at the bank of the river Saree, near its Eastern side, there is the beautiful Lalakhal Tea Garden. The water of the river Saree exists within the distance from Lalakhal to Sarighat and contains in store for the tourist a beauty which is very hard to see and experience throughout the whole of Bangladesh. The distance of Lalakhal to Sarighat is approximately 12 kilometer. In different parts of the area in the river Saree, there are areas where other rivers intersect as the water flows. In various areas of the river Saree, multiple colors of the water can be seen. For example, in one part of the river the color green can be seen, and in another part of the river, the color blue can be seen. The water remains transparent which adds an aesthetic sense to the whole stunning atmosphere of the place. The reason for the water being transparent is the mix of the river water with soil and with it mixing of the ground of the river. Apart from that, there is a wide area of mountain and tourists who like to explore the forest areas in Lalakhal can indulge themselves in seeing unique and the different regions and sights. Clouds can be seen embracing with the hills above and slowly passing away, the flow of the river continually moving into an unknown destination towards the expanse of the oceans, the river and the green forest and the tea garden all makes Lalakhal a must go for all tourists and travelers. The night scene of Lalakhal, and particularly the bank of river Saree which touch the tea garden factory, is the most astonishing thing ever to experience. From the dusk as darkness starts to diffuse the quality of Lalakhal changes as a different splendor diffuse through the area. The distance of the Lalakhal Tea Garden area takes approximately 40 minutes to travel if one travels through the river Saree. The distance of Lalakhal from the central town of Sylhet is a bit far, and as a result, boats remain no longer available in Lalakhal after evening. However for tourists who want to spend the night in Lalakhal and enjoy the sound of silence as it brings out into the darkness a beauty very genuine and pure; one can stay over the riverside of Lalakhal in a resort known as Northern Resort. There is another resort known as Nazimghor Resort which is very near from Lalakhal. 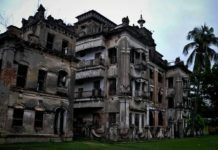 However those tourists who want to leave Lalakhal and spend the night in Sylhet must go by evening as after evening there remains no way, mainly through water, to return to the central town of Sylhet. Also, it is advisable for tourists to book the resorts at Lalakhal beforehand just for them to be on the safe side. There are various categories of costs involved in the tour of Lalakhal. Firstly from Dhaka to Sylhet, there are a bus, train and airplane services which are available. The cost of traveling by road will be from the range of 400 taka to 1100 taka. The cost of going by train will be from the range of 150 taka to 1020 taka. However, there is other price range available, and their information is available in Komolapur Rail Station. Travelling by airplane will cost taka 4000 which is the lowest to 8500 taka which is the highest price. However, these rates vary from airline service providers to providers. The time of bus journey takes approximately 6 hours, of train journey it takes 7 hours around, and by air, it would take less than or close to 1 hour. After traveling to Sylhet, from there to Lalakhal there are cars and microbuses and tourists at the cost of within the range of 1000 taka to 3000 taka can take these services. Microbus costs more than hired cars, and public transport from Sylhet to Lalakhal is also available in the form of bus and legoona (a pick-up van whose pick-up space is covered and passenger seats are planted in the pick-up space) which costs 70 to 80 taka. Once in Lalakhal the price of boats vary but are usually within the range of 600 to 800 taka. Finally, if any tourist wants to say at Lalakhal, particularly in the Nazimghor resort, the prices are near around 7000 taka and 15000 taka for a premier suite and presidential suite respectively. For further detailed information, tourists can visit the websites of the Nazimghor Hotel or get the phone number of these resorts and directly contact them for knowing the expense. Panthumai, also written as Pang Thu Mai, is another tourist hub in Sylhet which is situated in Gowainghat district. 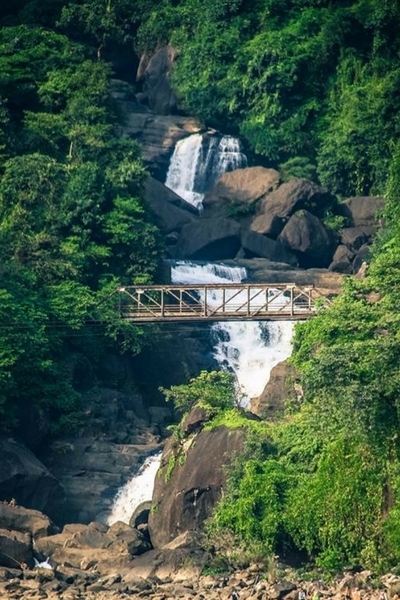 Tourists visiting this village can see the Panthumai waterfall, which is located on the Indian border. Through Panthumai a beautiful scene can be observed of the waterfall as it rushes down in a scintillating force. The atmosphere of the place is thrilling and simulates a sense of awe for those who visit Panthumai. Panthumai is a unique place as it consists of a grandeur scene, the Barahill falls, and with that the distant hills of various range surrounding the area. Panthumai has a different aura which can only be experienced by visiting the place. Tourists of all types, from those who like a quiet place to sit and relax and enjoy the scenario to those who wish to roam around, for all of them Panthumai has in store a package of genuine and wonderful experience. The river Peain flows just beside Panthumai and tourists traveling by boat upon the Peain can see a canvas of nature alive with freshness and vitality. It goes without saying that like many other places in Sylhet, Panthumai can be experienced to the fullest in monsoon season. Often many tourists regret a bit for not being able to see the Panthumai waterfall closely as it fell on the Indian side of the border. However, the beauty which lies on this side of the border is also not anything less. In particular during the time of sunset if one looks at the sky it takes a different color and forms separate layer, a deep shade of blue and above that a deep orange topped by an unknown color paving the way for the night to fall. Witnessing such scenes is graceful to watch as the beauty of nature finds an expression filled with splendor and grandeur for the tourist. Also for those who want to take pictures to box memories of beautiful places and for nature photographers, Panthumai is a heaven for them. In a different time of the day the environment takes on different pleasing appearance, and even in the cloudy dark sky the wind blows revitalizing the tourists. The Peain River is also another marvelous place to swim near its bank, float and relax and enjoy the scene around. There are BGB and BSF soldiers all around for border control, and an advantage of that is the place is very safe to relax and enjoy the various scenarios. How to Reach Panthumai from Dhaka? Tourists have to go to Sylhet through traveling by road, railway or air. There are bus services at various points in Dhaka such as Green Line Paribahan in Rajarbag, Shamoli Paribahan whose counters are in Arambag and Sayedabad area of Dhaka, Hanif Paribahan, etc. Tourists can search online and obtain relevant information about traveling to Sylhet by road. Apart from that, there are train services available at Kamolapur Railway Station. Tourists can also travel by air and will have to land in Sylhet Osmani International Airport. After reaching Sylhet, tourists have to go to Gowainghat, in an area known as Halderpar. From Halderpar there are boats which take tourists directly to Panthumai. The river journey is safe as life jackets are available from where the boat departs, and in particular, for those tourists who love boat ride journey, Panthumai is the best place for them. Located in Gowainghat, Sylhet, Ratargul is freshwater swamp forest. It is 26 kilometers away from the central town of Sylhet. Ratargul forest is economically and culturally very significant for Bangladesh as Ratargul is an area which consists of freshwater, and in the whole of Asian subcontinent only two places, out of which one is Ratargul, are there which have been classified as freshwater swamp forest. Ratargul forest is under the Forestry Department, Government of Bangladesh. For those tourists who love adventure in their tours, those who want to explore dense forests Ratargul is the place for them. The size of Ratargul forest is 325.61 acre, and often tourists who have visited Ratargul calls it the Amazon of Bangladesh. According to information available in Wikipedia in the rainy season water level in Ratargul forest rises to 10 ft. and somewhere even 15 to 20 ft. Therefore tourists visiting Ratargul in the rainy season will have a very authentic, eye-catching and startling experience, perhaps those once in a lifetime experience which everyone craves for. To visit Ratargul tourists need to take permission from the local Forestry Department, and request them for a boat. The boat that will be provided to the tourists is an engine boat, and with that boat, the tourists can start their incredible journey of exploring one of the finest swamp forests of the world. Words are not sufficient to describe the beauty of Ratargul and particularly the intensely magnificent environment a tourist will get exposed to as he/she keeps on entering the forest. There are areas which are so dense that a small glimpse of sunlight can be noticed, and it is guaranteed that a tourist will feel that he/she has entered into a different world, a world far away from the hustles of the city and the worries of the daily life. Ratargul will give the tourists a world of astounding silence and a magnificent living portrait of the natural life. Various animals such as monkeys, squirrels, wolves will cry welcoming the tourist in an unknown yet amazing world. Apart from that diverse type of fishes, a wide range of plants distinct in appearance and majestic as well will surely catch the eye of the tourists. The boat journey will be for the tourists a journey worth writing a novel or story about. How to go to Ratargul? Tourists can go to Sylhet by air and land directly in Sylhet Osmani International Airport, or from Dhaka, tourists can go by road to Sylhet first through their car or hired car or bus service. By road, it takes 6 hours to reach Sylhet from Dhaka. Also, tourist can use train service to reach Sylhet which they can avail for themselves by going to Komolapur Railway Station. After reaching Sylhet tourists will find there are various ways to each Ratargul. However, the easiest and efficient way is to hire a CNG auto rickshaw or a car and go to Goain Ghat. It will take approximately 2 to 3 hours to travel to Goain Ghat from the main town of Sylhet. 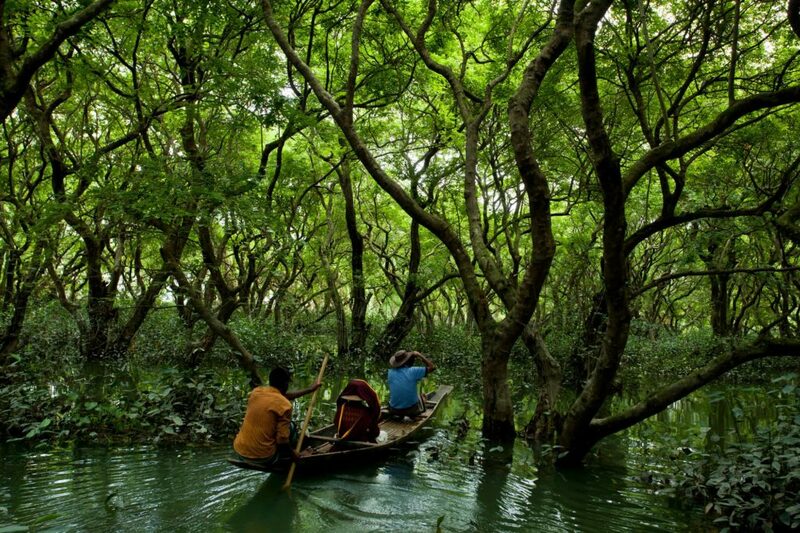 Once reaching their tourists will be able to hire boats and start their exploration into the dense forest of Ratargul. With each boat there happens to be a local man is a part of the local forestry department. He operates the boat and knows the dense areas inside the Ratargul forests and how to get back safely. As a result, the safety of the tourists is ensured by the Forestry Department of Sylhet. However, it is highly advisable that when visiting Ratargul tourists must only take permission from the Forestry Department and not other people as there is a chance of hijacking. The best time to visit Ratargul is in monsoon time, probably around the end of June to the end of August. Bisanakandi is situated at Bangladesh-India border in Sylhet. It is a landscape beauty among gardens and hills. Bichanakandi is a village situated in Rustompur Union under Guainghat Upazilla. This is where many layers of the Khasi mountain meet at a single point from both sides. Flowing from above is a high fall. Adding to its charm are dark clouds hugging the mountain in the rainy season. And flowing underneath towards Bholaganj is a branch of the Piyain. Along the stream flowing from high up in the mountain come huge boulders that are deposited and mined in Bisanakandi. 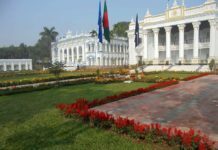 Other places to visit in Sylhet are Shrine of Hazrat Shah Jalal and Shah Poran, Temple of Sri Chaittayna Mahaprabhu which is 500 years old and an amazing place to visit, Tamabill, Malinichera Tea Garden, etc.